The Sensational Magazine WordPress theme is one of the sought-after premium WordPress Themes that is particularly formed for acknowledged blogs and magazine websites. The theme highlights the beauty of your blog or site and converts it into something real appealing and professional. The three-column theme design is ideal for technology blogs and online newspaper websites and the availability of different colors and layouts give you freedom to present your content in the finest of ways possible. The Sensational Magazine WordPress theme features different, responsive layouts which helps increase page views and readability of your blog. In addition, the responsive feature also adds the visibility of your blog on any device. The choice of 4 unique homepage designs enable users highlight their homepage, which ultimately results in more page views. 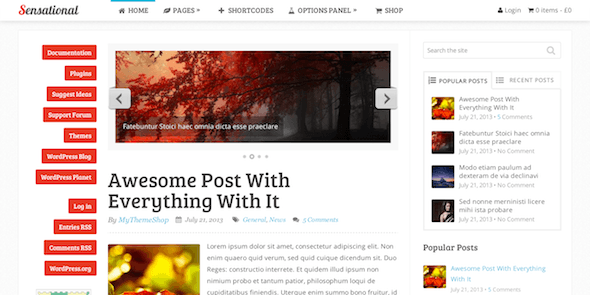 Similar to other MyThemeShop WordPress Themes, this theme is also loaded with custom theme options panel. These options allow users customize their blogs and give their page a personal touch. The choice to modify header logo, typography, background colors or image or favicon are just to name a few custom choices from the options panel. Google AdSense is undoubtedly one of the most favored approaches to monetize your blog and to make good money online. The Sensational Magazine Theme because of its click-optimization feature helps you earn even more with AdSense and other relevant ad publishing media. With Sensational Magazine Theme, it’s now on your fingertips to choose your favorite color schemes and preferred backgrounds. From textures to patterns and solid colors, this theme offers a little something to everyone. This theme provides unparalleled reading experience on different displays and screen sizes. Whether iPhone or tablets, Smartphones or desktop PC’s, now you don’t need to comprise your love for reading at all. Typography is an integral element of any persuasive web design. The Sensational Theme enables you pick from the huge range of 620+ Google fonts. The best part is this selection can be done from the admin option panel and you literally don’t need to disturb the code. Sensational Magazine theme is SEO-optimized, which means your content will naturally be indexed and outpace your rivals automatically. The custom dashboard design is another perk that helps you shape up your blogging experience by offering painless access to the most frequently used tasks. Now you don’t need to include pile of plugins to build your blog as this theme comes with 12 custom widgets which help you design your blog effortlessly. This theme comes integrated with web’s prominent ecommerce plugin WooCommerce, making it all easy and straightforward to retail your products over the web. This user-friendly yet feature-rich combo isn’t only perfect for novices but also for established sellers to sell their products or services easily. Take your business to the next level by incorporating a translation file. By doing so will help you reach international clients and to expand your selling at global level. All in all, the Sensational Magazine WordPress Theme is wonderful theme to design a professional blog or an intriguing magazine site. Moreover, you can also create an authority blog by using some of the features of Sensational. Engage traffic with a fresh and splendid designed Theme and enjoy greater sales! Amazing Review Thanks for sharing this theme details.